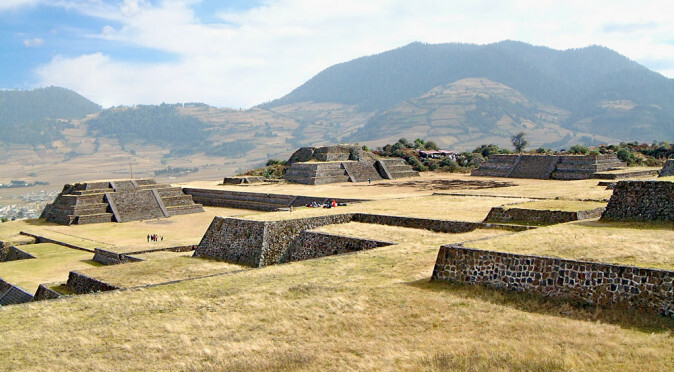 The entrance to the ceremonial complex at Teotenango is through the Plaza Del Jaguar, which features a carving of a jaguar on the wall from which the plaza takes its name. 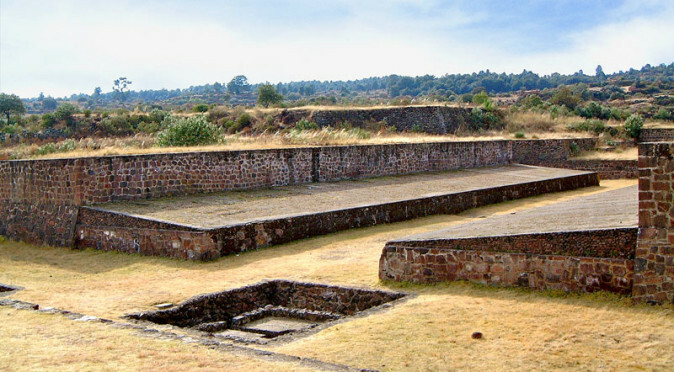 The carving is believed to be contemporaneous with the construction of the huge platform on which it is carved, which forms the base of Group A and the primary terrace for entire complex. 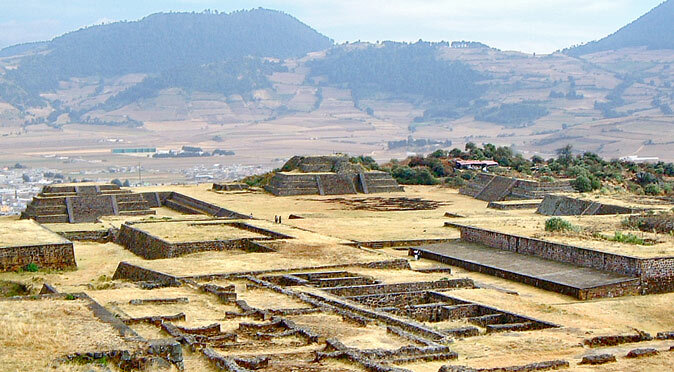 The carving must therefore predate the constructions of Group A, which are known to have been completed in Stage 3, between 900AD and 1162AD, and it could have been carved during Stage 2, which began in 750AD, when work was first undertaken at the hilltop site. 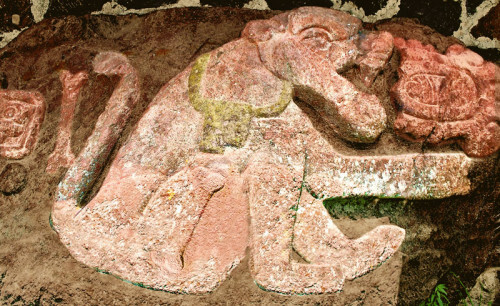 The carving features a jaguar that is seated in an unusually humanesque way with remarkably large feet (see figs. W0019TO & W0019TOH). The jaguar holds out a paw as if to receive something and above the outstretched paw is a circular motif. 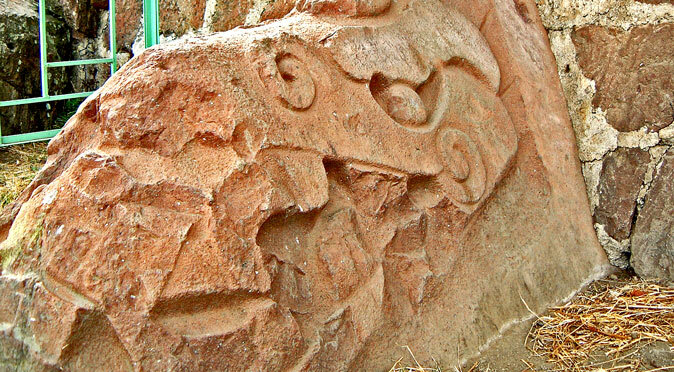 The eroded motif features an oval-shape that is bordered by frills, which look like petals, but could also be ventricles or spurting blood. 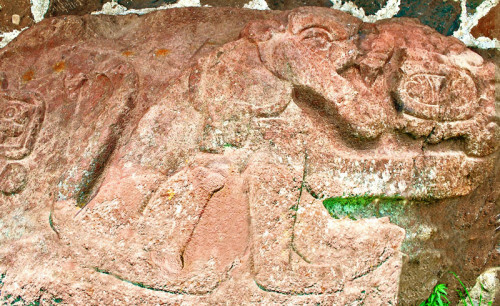 A section close to the mouth appears to be missing, which gives the appearance of the jaguar having taken a bite from it. The jaguar wears a squared pendant around its neck and has a long bone shown on its thigh, which is presumably the femur. Curiously, the long bone appears again behind the jaguar, between it and the date glyph which reads “2-Rabbit”. 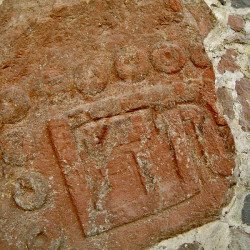 There are two date-glyphs found in the vicinity; the first is “2-Rabbit” which appears on the same carved block as the jaguar; then a second date is found on an adjacent block which reads “9-House”. The bearing of the glyphs, or indeed the dates they describe, is not known. 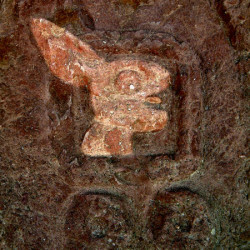 But it is certain that at least the “2-Rabbit” glyph is central to the information being supplied by the jaguar carving. In the year 2-Rabbit, the bone (e.g a celestial body) entered the jaguar-leg (e.g. 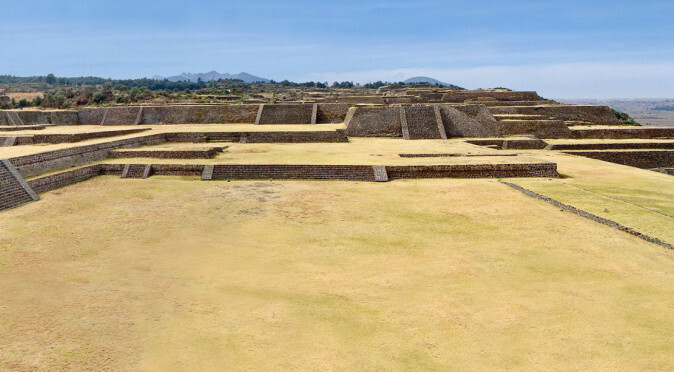 a portion of a large jaguar constellation) and the jaguar-lord (e.g. the ruler of this city, or another which is denoted by the pendant) feasted on hearts (i.e. defeated a peoples described by imagery within the heart). This event was recorded on 9-House with the erection of this city you are now entering. 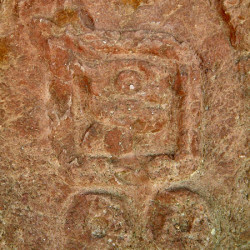 This is by no means a translation of the carving, that remains unknown, but it is an example of how such carvings were read.